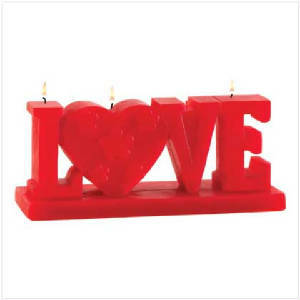 With bright red letters spelling out that special word, this candle leaves no doubt about your romantic feelings. A playful way to show someone special that your love is an eternal flame! 8 hours of burn time. Weight 0.8 lb. Palm and paraffin wax. 6 3/4 x 2 3/8 x 2 3/4 high. 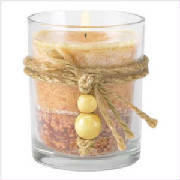 Lushly scented candle in decor-friendly earthtones is a naturally perfect addition to your home! Pleasing layered shades of ocher, caramel and cream bring a touch of warmth to any color scheme, along with a subtle, soothing wood-spice scent. Beaded rope trim adds a fashionable touch. Paraffin wax in glass cup. 2 3/4 diameter x 3 3/8 high. Stacked layers of mottled caramel colors lend a delicious warmth to a handsome stone-like candle in an intriguing cubed shape! 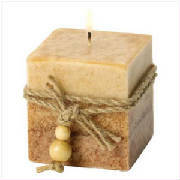 Simple and rustic, yet utterly sophisticated, this delightful candle gets extra artistry from genuine beaded rope trim. Pleasing Spiced Wood fragrance soothes the air with a subtle perfume. Paraffin wax. 2 diameter x 3 high.